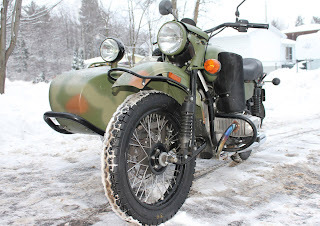 Red Thread is off to the chilly, frozen bits of Russia in an attempt to drive 2,500km across the Siberian wilderness on an old Ural motorcycle with sidecar. The goal is to drive from Irbit, the home of the Ural, to the only town in the world sitting on the Arctic Circle: Salekhard. We will join 11 other foolhardy teams complete the adventure. Last year folks endured -50C weather, broken motorcycles, wild dogs and drunken locals. This year should be even better. Red Thread Adventures is about two things, helping those in need and making the world a more interesting place. We raise money for our chosen causes as well as donating our time and expenses to undertake global challenges and inspire others to do the same. For this adventure we are raising funds for our favorite charity, Half the Sky Foundation. There are thousands of kids that benefit from Half the Sky's excellent programs. Please click the donate button on the left or click on the motorcycle on the right and give what you can.